Like I mentioned last month, I love being in a book club. 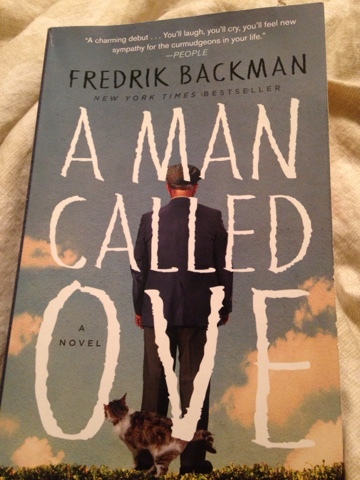 I am excited to be the co-host with Bonnie this month for the novel "A Man Called Ove" by Fredrik Backman. Summary: Meet Ove. He's a curmudgeon, the kind of man who points at people he dislikes. He has staunch principles, strict routines, and a short fuse. People call him the bitter neighbor from hell, but must Ove be bitter just because he doesn't walk around with a smile plastered to his face all the time? 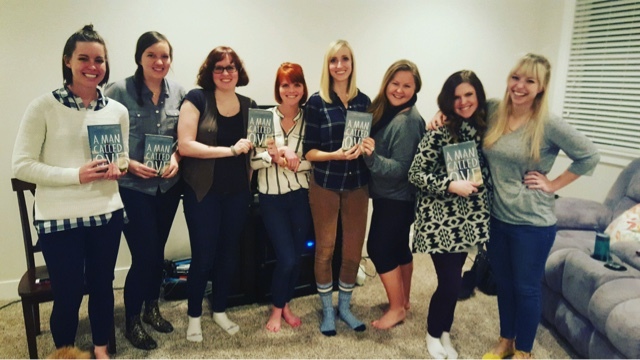 One thing that is so interesting to me about book clubs is that I come away from them with such a different perspective than I did before going in. This novel caused such an interesting discussion because some members of the group did not love the cheesiness that accompanied this story. Call me a romantic (okay, I am one!) but I loved it. I loved the heartfelt, compelling story that showed that even a horrible man like Ove, all have a good side, even if it's in unconventional ways. I think that Ove's character is incredibly unlikeable. In a way, almost painful. He is, frankly, horrible. He is a bitter old man (although the book said that he was 59? Since when is that considered old? That was a bit confusing) who clearly has a lot of negative emotion to work through. For me, I wanted to learn about his past. I know that Ove was stuck in his ways because of experiences that we went through. So, for me, I wanted to keep reading so that I could understand WHY he was acting that way. I don't think that Ove could have carried the story alone. I think that he needed some serious help from his hilarious neighbors, if that makes sense. With that, my favorite character in the story is Paravaneh. I loved her. So much. I loved that she was feisty and annoying, but you loved her in spite of them. I loved that she didn't take Ove's crap. She added some pizzazz and realistic nature to the story, in my opinion. In the story, Ove mentions that when you don't share sorrow, it can drive you a part. That is what happened with him and his neighbor Rhune. I think that this is SO true. Often times when someone is going through a hard time, they need someone to step up and in a sense say "I'm here for you. I've been through this." These types of trials either make or break a relationship. Unfortunately, for Rhune and Ove, the death of a loved one, tore them apart. I have seen this happen in my own life and the lives of so many others, so I could relate to this part of the story immensely. All in all, this book was not perfect. It had many flaws. It wasn't written amazingly well (was it translated from Swedish, by the way? We were wondering that in book club? I know he is a Swedish author...), One's grumpiness, for me, got quite annoying (Like...we get it...you are pissed off at the world! Ha) and the idealism that correlates with this story can be unrealistic. But, honestly, I loved it. I found myself crying towards the last few pages because it just made me want to be a better person. As cheesy as that sounds. I loved seeing the beauty of change in mankind and all the wonderful things that can happen when you have a "village that loves you." He was a man of black and white. And she was color. All the color he had. But sorrow is unreliable in that way. When people don’t share it there’s a good chance that it will drive them apart instead. 1. What did you think about Ove and Sonja's relationship? How do you think it affected him? 2. In the story, Ove mentioned that when people don't share sorrow, it can drive them apart. This happens to him and his friend Rhune. Do you think that this statement is true? 3. Who is your favorite character in the story? 4. Is Ove likable enough to carry the story? 5. Did you see any symbolism in the cat or the Saab? Or you can just talk about some of your thoughts from reading! I would love to know your thoughts! Labels: bon's book club, book club, books., friends, man called ove, meeting, sierra's book reviews. Thank you for this post. My reading group will be reviewing this next month (with me as the discussion leader), and I love your insights, which I will share with my group. Personally, I loved the book. I read it almost a year ago, so I have to review it again. I never spot the symbolism until someone points it out to me!